Adds a handler This function adds a new handler to be called when the message arrives. Repeated additions of the same handler function will be ignored. Sets a handler This function sets a handler to be called when the message arrives. Any existing handlers are unregistered. Removes a handler Removes a handler from the list of handlers. Attempts to remove handlers that aren't in the list are silently ignored. Definition at line 299 of file llmessagetemplate.h. Definition at line 463 of file llmessagetemplate.h. Definition at line 302 of file llmessagetemplate.h. Definition at line 325 of file llmessagetemplate.h. References LLDynamicArrayIndexed< Type, Key, BlockSize >::begin(), LLDynamicArrayIndexed< Type, Key, BlockSize >::end(), and mMemberBlocks. Definition at line 330 of file llmessagetemplate.h. References llendl, llerrs, MBT_MULTIPLE, MBT_SINGLE, mMemberBlocks, LLMessageBlock::mName, LLMessageBlock::mNumber, LLMessageBlock::mTotalSize, mTotalSize, LLMessageBlock::mType, and NULL. Definition at line 396 of file llmessagetemplate.h. Referenced by LLMessageSystem::addHandlerFuncFast(), and setHandlerFunc(). Definition at line 438 of file llmessagetemplate.h. References FALSE, mHandlers, and TRUE. Referenced by LLMessageSystem::callHandler(), and LLTemplateMessageReader::decodeData(). Definition at line 433 of file llmessagetemplate.h. Definition at line 456 of file llmessagetemplate.h. References LLDynamicArrayIndexed< Type, Key, BlockSize >::end(), LLDynamicArrayIndexed< Type, Key, BlockSize >::find(), mMemberBlocks, and NULL. Definition at line 352 of file llmessagetemplate.h. 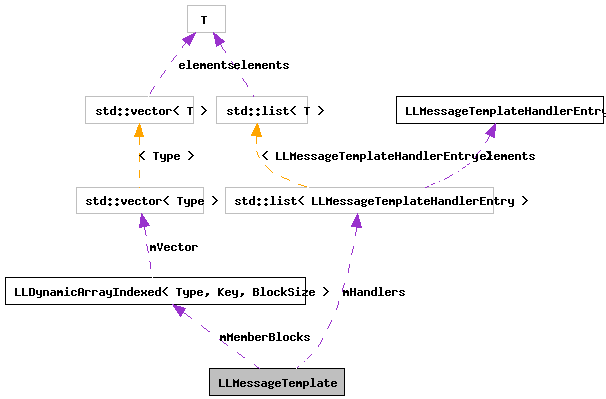 Referenced by LLTemplateMessageBuilder::addData(), tut::LLMessageTemplateParserTestData::ensure_block_attributes(), LLTemplateMessageBuilder::isMessageFull(), LLTemplateMessageBuilder::nextBlock(), and LLTemplateMessageBuilder::removeLastBlock(). Definition at line 383 of file llmessagetemplate.h. Definition at line 373 of file llmessagetemplate.h. Definition at line 363 of file llmessagetemplate.h. Definition at line 449 of file llmessagetemplate.h. Referenced by LLMessageSystem::callHandler(), and LLTemplateMessageReader::isBanned(). Definition at line 378 of file llmessagetemplate.h. Definition at line 369 of file llmessagetemplate.h. Definition at line 416 of file llmessagetemplate.h. References addHandlerFunc(), llendl, llwarns, mHandlers, and mName. Definition at line 358 of file llmessagetemplate.h. Definition at line 137 of file llmessagetemplate.cpp. Definition at line 480 of file llmessagetemplate.h. Definition at line 481 of file llmessagetemplate.h. Definition at line 475 of file llmessagetemplate.h. Referenced by LLTemplateMessageReader::decodeData(), and LLMessageSystem::dumpReceiveCounts(). Definition at line 469 of file llmessagetemplate.h. Referenced by getDeprecation(), and setDeprecation(). Definition at line 468 of file llmessagetemplate.h. Referenced by getEncoding(), and setEncoding(). Definition at line 466 of file llmessagetemplate.h. Referenced by LLTemplateMessageBuilder::buildMessage(), LLTemplateMessageReader::decodeData(), and operator<<(). Definition at line 484 of file llmessagetemplate.h. Referenced by addHandlerFunc(), callHandlerFunc(), delHandlerFunc(), and setHandlerFunc(). Definition at line 478 of file llmessagetemplate.h. Definition at line 464 of file llmessagetemplate.h. Referenced by addBlock(), LLTemplateMessageBuilder::buildMessage(), LLTemplateMessageReader::decodeData(), getBlock(), LLTemplateMessageReader::getSize(), LLTemplateMessageBuilder::newMessage(), operator<<(), and ~LLMessageTemplate(). Definition at line 470 of file llmessagetemplate.h. Referenced by LLMessageSystem::addTemplate(), LLTemplateMessageBuilder::buildMessage(), and operator<<(). Definition at line 465 of file llmessagetemplate.h. Referenced by LLTemplateMessageBuilder::addData(), LLMessageSystem::addTemplate(), LLTemplateMessageReader::decodeData(), LLMessageSystem::dumpReceiveCounts(), tut::LLMessageTemplateParserTestData::ensure_block_attributes(), LLTemplateMessageReader::getMessageName(), LLMessageTemplate(), LLTemplateMessageReader::logRanOffEndOfPacket(), LLTemplateMessageBuilder::nextBlock(), operator<<(), setHandlerFunc(), and LLTemplateMessageReader::validateMessage(). Definition at line 473 of file llmessagetemplate.h. Definition at line 472 of file llmessagetemplate.h. Referenced by LLMessageSystem::dumpReceiveCounts(), and LLTemplateMessageReader::validateMessage(). Definition at line 474 of file llmessagetemplate.h. Definition at line 476 of file llmessagetemplate.h. Definition at line 477 of file llmessagetemplate.h. Definition at line 471 of file llmessagetemplate.h. Referenced by addBlock(), and operator<<(). Definition at line 467 of file llmessagetemplate.h. Referenced by getTrust(), and setTrust().